TC Pipelines, LP cut its distribution in early 2018. Is the bad news over, or is the partnership still in an investment no-man's land? 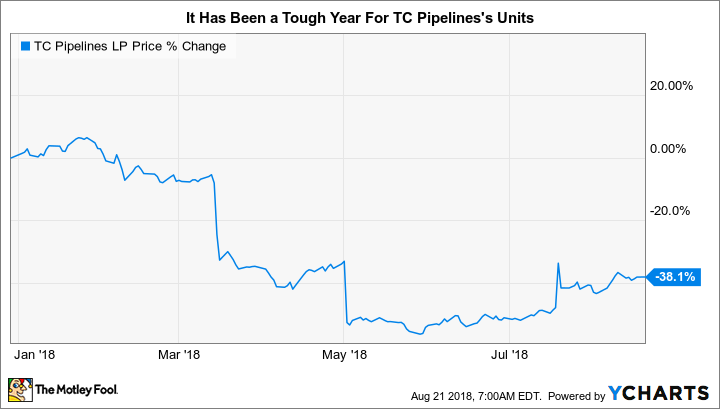 TC Pipelines, LP (NYSE:TCP) did something that no limited partnership wants to do in May of this year: It reduced its distribution. The 35% distribution cut was clearly material for unitholders, and was compounded by a nearly 30% drop in TC Pipeline's unit price. Although the units have gained some ground back, they remain off roughly 40% for the year. Value-conscious investors might wonder, however, if TC Pipelines, with its still generous 7.9% yield, is a buy at this point? The headline story for TC Pipelines was a proposed ruling change by the Federal Energy Regulatory Commission (FERC). The company specifically highlighted the proposed rule change when it announced the distribution cut. The issue that FERC was attempting to address is complex, but the end result is that the proposed rule change would have barred recovering certain income tax allowances in the cost of service rates on many of TC Pipelines' assets. The simple version of all of this is that such a change would mean that the partnership wouldn't make as much money as it did before. The partnership acted proactively in trimming its distribution to get ahead of any potential impact. Although hard for unitholders, it was a reasonable and responsible move that was good for the partnership's long-term viability. When the final rule came down, it wasn't quite as bad as investors feared. (Keeping it simple again, FERC allowed some wiggle room for price adjustments to soften the blow.) That was good news, and sent the shares of TC Pipelines and many peers higher. But the story isn't over. 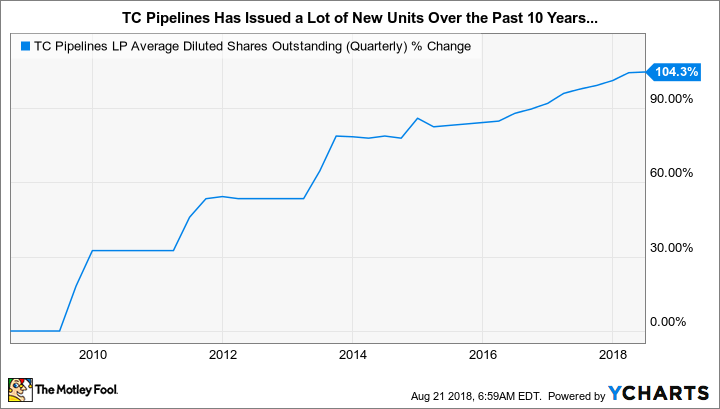 TC Pipelines's units remain down nearly 40% so far this year -- and that's not just bad for unitholders, it's also bad for the partnership's general partner and parent TransCanada Corporation (NYSE:TRP). TC Pipelines is, after all, effectively a funding source for TransCanada. TransCanada sells assets, also called drop downs in the midstream space, to TC Pipelines. This helps TransCanada raise cash that it can use to invest in its business. However, because TransCanada is the parent and general partner, it continues to control the assets it sells to TC Pipelines. And it can benefit financially, as well, from distributions that TC Pipelines makes over time since it owns an interest in the pipeline company (roughly 25% of the outstanding units and a 2% general partner interest). Using TC Pipelines as a funding source is really a win/win for TransCanada. TC Pipelines benefits from these transactions because they allow the partnership to grow its business. That, in turn, allows it to grow distributions. However, this model only works if TC Pipelines can raise money at reasonable prices so it can pay for the assets that TransCanada is looking to sell. Historically, that has meant TC Pipeline issuing new units. However, with TC Pipelines' unit price at its current depressed level, TransCanada has stated that it doesn't view the partnership as a viable funding alternative -- the unit price is just too low. That suggests that TC Pipelines' growth will be materially limited until its unit price gets high enough to make it a viable funding alternative again. TC Pipelines is currently focusing on preserving cash so it can fund capital expenditures and reduce debt. And while the impact of the FERC rule change won't likely be as bad as expected, it will still be a material hit, reducing the partnership's revenues by $40 to $60 million. Although that's down from an estimated $100 million, it's still a huge number given that the partnership's transmission revenues totaled $422 million in 2017. In fact, TC Pipelines hinted in its second quarter earnings release that it might even decide to reduce the distribution again. That might be the right move for the partnership, since it will help ensure its long-term viability, but it will certainly not be good for income-focused unitholders. And it probably won't help increase the unit price, either. There are a lot of moving parts at TC Pipelines right now, and the outlook is clouded by uncertainty. Income-focused investors should probably avoid the partnership and its generous 7.9% yield at this point because there's material doubt as to whether or not TC Pipelines will continue to support its current, reduced payout. Longer term, TC Pipelines' growth will remain subdued until its unit price rises enough for it to again be a viable funding source for parent TransCanada. At this point that doesn't seem likely to happen anytime soon. And until TC Pipelines can address this issue, perhaps by finding alternative ways to grow, most investors would be better off elsewhere.